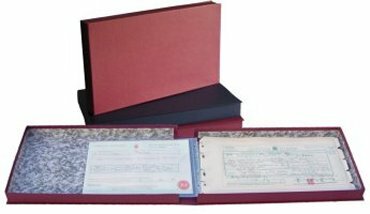 This super high quality premier certificate box binder is covered with acid free library buckram and lined with acid free paper. Takes the longer traditional certificate size or the current A4 certificate size. Store your certificates and other important documents in this safe enclosed binder which will also stand or stack on shelves. The 4 'D' ring mechanism will hold up to 40 pockets to store 80 documents with an acid free card insert which allows two documents back to back. Dimensions 18 x 10½ x 2 inches (46 x 27 x 5 cm) approx. Available in Burgundy or Dark Blue covered acid free library buckram. Takes both the long acid free certificate pockets and the A4 landscape acid free pockets.